Its time to head down to the range, and whether you are shooting with a handgun, a shotgun, an AR-15 or an RPG, you will need to hold your equipment, ammo, and accessories. Otherwise, you will find yourself struggling. Struggling means borrowing, scrounging, buying and in the worst case, red face shameful retreat back home to get that damned plastic Costco bag or a Nine West shoe bag…ha! OK, so you have decided not to be a chump and invest a few hard-earned dollars or borrowed some moolah to buy a gun bag, but guess what, there are so many to choose from you don’t know what to get. 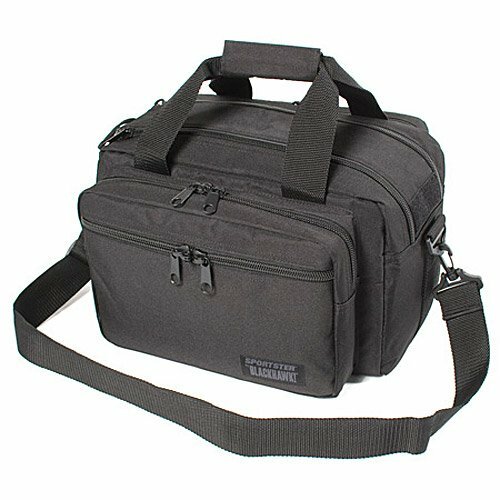 Well, this is where I come in, after reviewing hundreds of the best range bag for pistols for you, as well s trying out over 30 of them personally, and with over 25 years of military (combat- Master Sergeant) experience, I have managed to narrow the focus onto the ten best tactical range bags, and now I can safely present to you, with confidence and integrity, the best gun range bag review online. The Osage is a soft yet rugged and durable 600D ballistic nylon weave. This weave is a strong military grade material and is used for supporting heavy weights and hard, sharp objects that will not tear, rip or fray the cloth. The seams are double stitched, and the zippers are heavy duty chunky parts that do not lock or stick. The zippers come with a monkey pull not from Red Oxx, so opening them is also efficient. The handle is lightweight but sturdy, so don’t let it fool you, and it connects with Velcro, so you get extra functionality. The included strap is a bit flimsy; you might want to upgrade it, perhaps with a heavy camera bag option. The bottom of the bag has four plastic feet, so you can place it on any surface and it won’t damage the bottom of the bag. The compartments are ample, easy to access and you can store plenty of accessories, ammunition, cleaning materials, and of course if you want, handguns too. 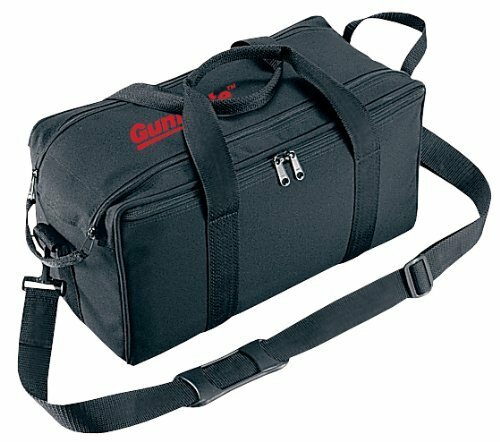 The GunMate is a great durable range bag that is made of D600 nylon weave. It comes with a lockable zippered main compartment and also lockable and zippered side compartments. The wraparound web carry handles are very adaptable and comfortable for use, and the adjustable shoulder strap is sturdy enough to carry most loads. This model comes with three inner compartments, that can be sued for dividing the contents between weapon, ammunition and tools/accessories. These compartments can be made easily by using the Velcro patches inside the bag, and essentially, you can have one, two or three compartments based on your own needs. This bag comes with a comfortable pistol rug; this is used to wrap your weapon, protecting it from other metallic parts that might scratch the finish and wood or plastic components. The lockable zippers provide extra protection, and a padlock (not included) can be easily added to this component. The shoulder strap is strong enough to make this a comfortable fit for carrying heavy loads. This is a reliable bag that is capable of handling heavy loads, and you can place up to four handguns and loads of ammunition, essentially reaching a load of 80 Lbs. If you do decide to reach this level of weight, make sure you use not only the shoulder strap, but also the handle, and make sure you can physically carry such a load. 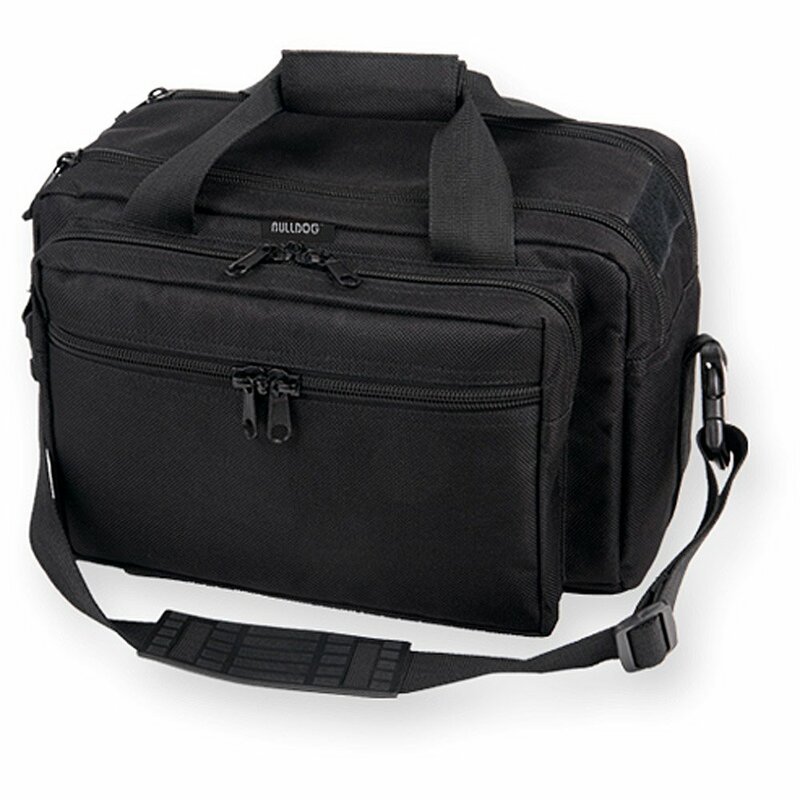 This is a medium sized gun and is one of the best handgun range bags on the market. This black bags dimension are 16″ x 8″ x 7″. When it comes to rugged and sturdy, the Blackhawk Sportster Deluxe is perhaps a leader in the pack. This is definitely one of the best tactical range bag options you can find. It is fabricated out of 600 denier polyesters with added PVC laminate for extra stability. There is one slash pocket, and three compartments secured by dual-zippers. This bag contains dual-density foam which is supported by an internal open-cell foam providing exceptional weapon protection and an external closed-cell foam unit that provides impact protection. The bag comes with a removable Gun rug and a convenient pistol pouch which is lined with an Internal soft fabric for added protection against wear and tear. The wraparound tactical web handles give you extra load bearing power, and the shoulder straps also sport rugged webbing for extra strength. All the contact points are also supported by webbing, and the seams are bound with two rows of locked stitching for improved durability. 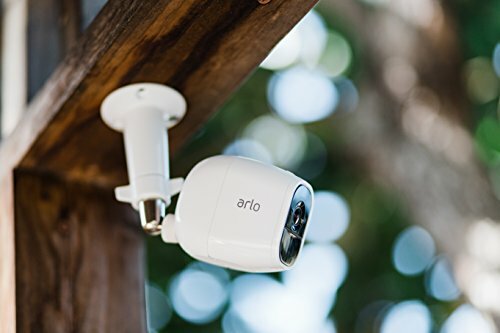 What can I add to the name 5.11 that will improve on this product’s features? Nothing, since all 5.11 products are high quality and built to perfection. The Range Ready™ Bag is another 5.11 Tactical® masterpiece and is engineered to be one of (if not) the best range bag on the market. This sturdy bag comes with segregated, padded storage for multiple pistols and a drop-down front flap that stores 8 magazines. The ammo and brass storage is removable, and all this is made of durable, strong 600D polyester. This bag features an integrated hydration storage solution and also comes with small sized accessory pockets for optics and ear protection. The grab-and-go handles are reinforced for extra load bearing capability, and the padded shoulder strap is removable. The zippers are all YKK® hardware. The Explorer is another near perfect gun range bag that stands out from the rest. This is a600-denier polyester fabric, reinforced with Nylon straps and plastic feet. This bag was designed by professional range experts and is a real range ready bag that covers every consideration. 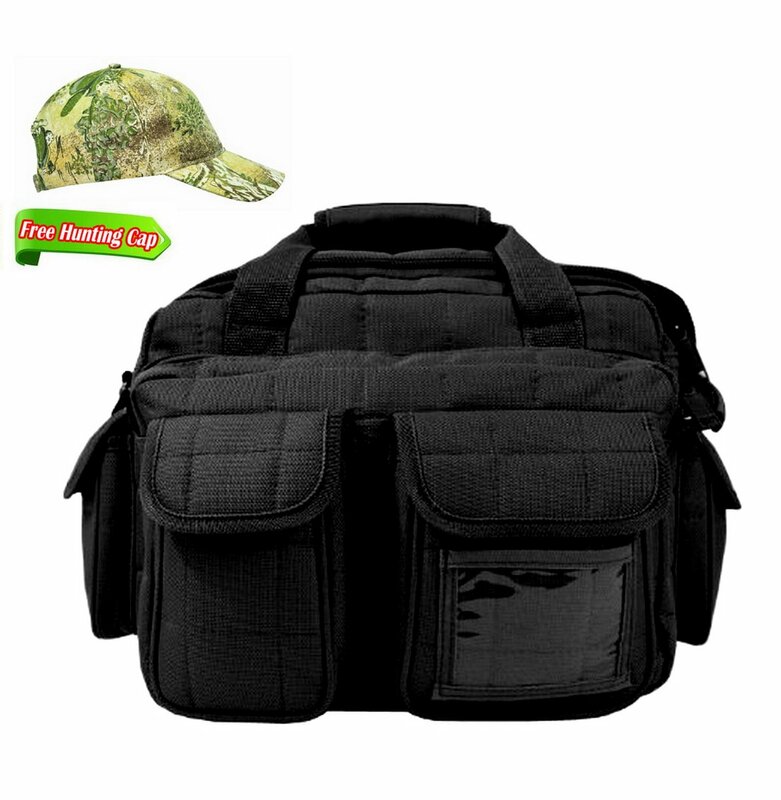 This bag is roomy enough for your ear protection, ammunition, magazines, pistols, cleaning supplies and hardware. 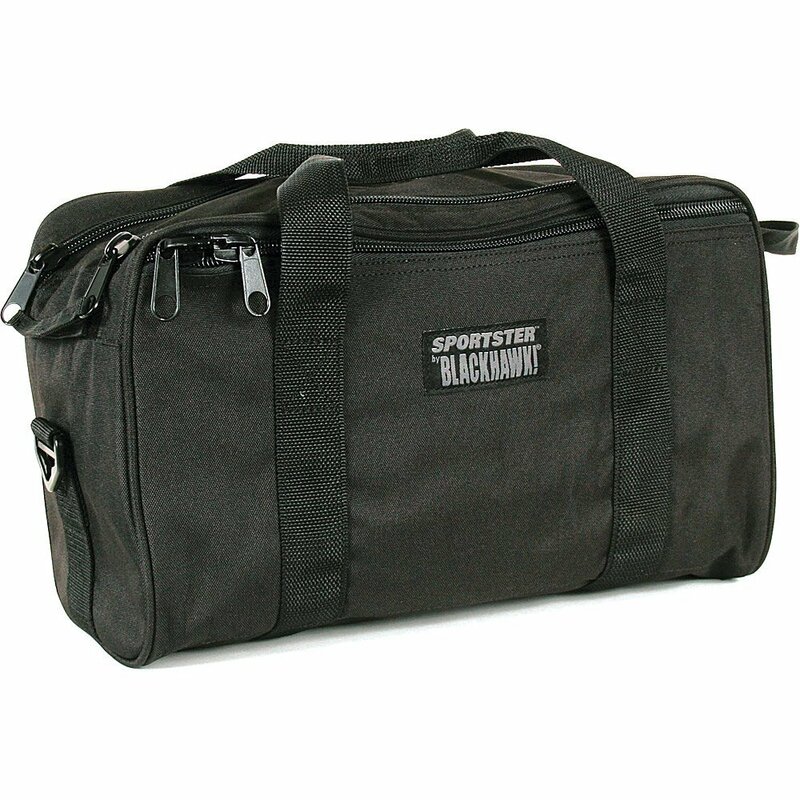 The Blackhawk!® Sportster™ Pistol Range Bag is another great solution provider. This is a small pistol bag, that will hold up to two handguns and all the ammo and accessories you will need for a good range shoot. This model comes with two interior slash pockets, and 2 flannel lined rugs. 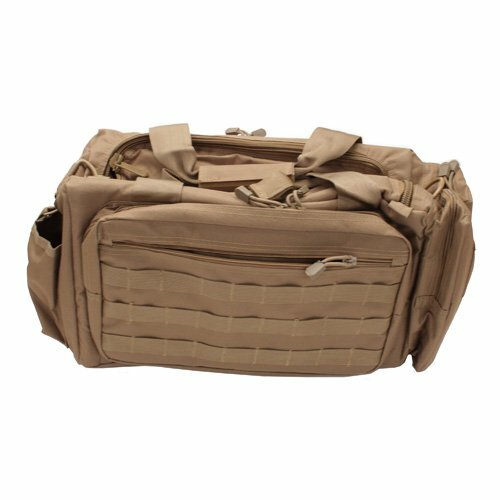 The interior pocket comes with a dual-slider opening for fast and easy access, and the whole shebang comes with MOLLE webbing. 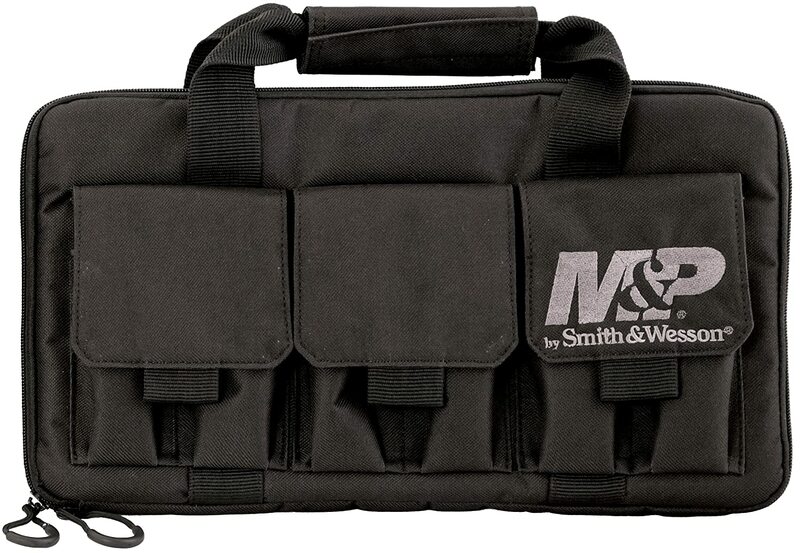 This bag gives you wraparound tactical web handles to assure you of full load bearing efficiency. The Bagh itself is made of a tight-weave, 600 denier polyester that is supported by a thick PVC laminate, and the Interior compartments are lined with extra soft fabric. The dual-density foam design interests open-cell inner foam for gun protection and closed-cell foam on the outside to protect the contents from impact damage. This bags dimension are (L x H x D): 16″ x 9″ x 8″, and this is possibly the best small range bag on the market today. 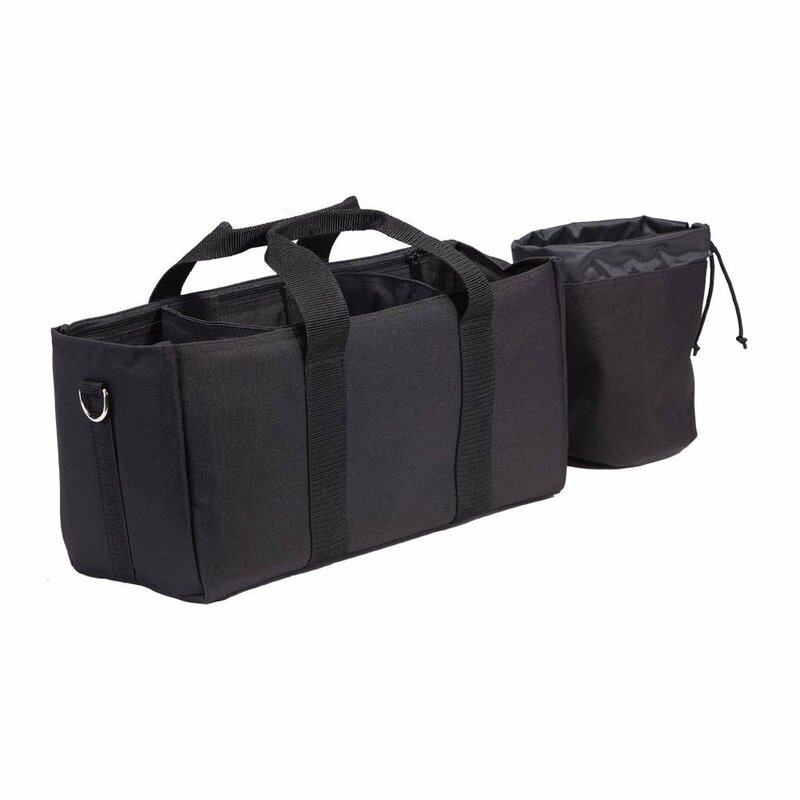 The Bulldog Deluxe Range bags is a Police range bag and is made sturdy and moisture-resistant nylon. The zippers are the all heavy duty and easy to operate, with anti-sticking capabilities (self-healing). 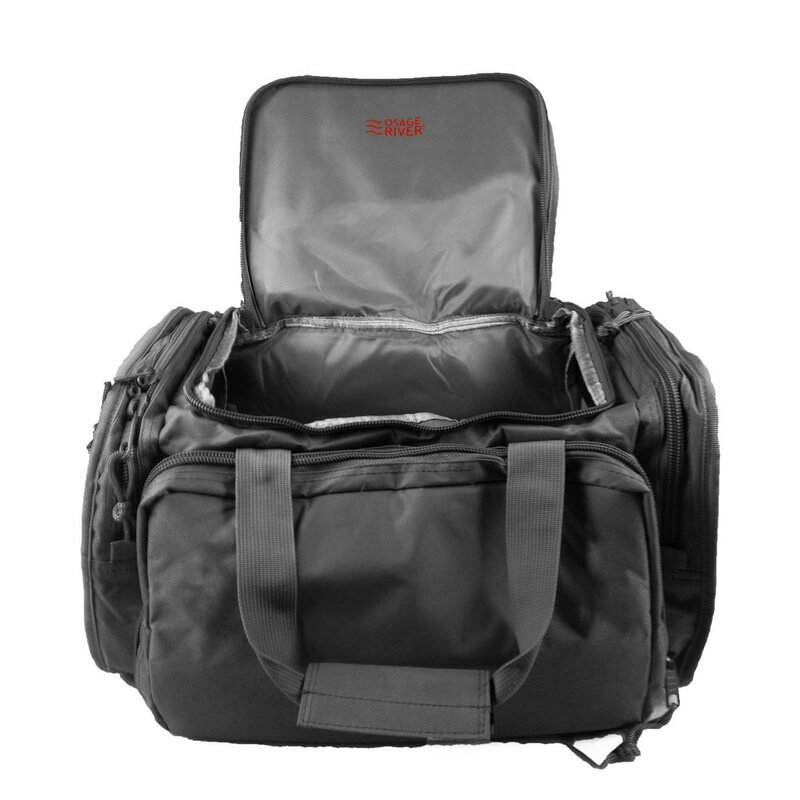 This bag comes with an extra large inner compartment supported by a large outer compartment, providing you with extreme storage capabilities. This means you can get add as many weapons, ammo, and accessories you want into its comfortable compartment capacity. The Explorer Padded Deluxe Tactical Range and Gear Bag is a full tactical bag and is designed for heavy-duty use, on and off the range. This bag is made of 1200-denier nylon, which is double that of all its competitors, this makes this bag the most resistant and most rugged of all the range bags in this review. The features of this model include extra padding for double security, making sure your contents are amply protected. The padded quick detach shoulder strap is used to assure a fast deployment in case of emergencies. The compartments include a dual zippered Fast Access Main Compartment and two exterior front pockets with an extra ID pocket. There are gear and magazine nylon elastic loops that give you quick release during the intense situation, and it comes with two beverage (cylindrical) holders for personal hydration. To sum it all up, there is also a roll-up, double zippered flap with hook and loop closure covering the main compartment which adds extra protection in all weather and external conditions. The Pro Tac Backpack is more than a gun range bag; it’s a gun range backpack. This gives you extra carrying power, and you can even adjust the straps around your shoulders and waist, so you can use it in the field. This beast of a bag comes with dual zipper opening features and sizeable Internal zippered mesh pocket. There is also a laptop pocket for the strategic field commander. The chest strap comes with dual buckles, and an adjustable waist strap, as well as a side, carry strap and a deep, spacious front pouch, and that’s not all, it comes with 2 zippered accessory pouches. The Nc Star Competition Range Bag is a sizeable range bag that comes with some great features that add to an all-around comfortable experience. This bag has a large main zippered compartment with two internal End Pockets. These come with hook and loop fastener Flaps that are perfect for storing pistols. The zippers come with grommets which makes it easy to padlock and seal your bag from unwanted pilfering. The main cover has loop fastener panel that is used with hook and loop Patches, and the padded front compartment is organized to separate the contents for easy and quick access. 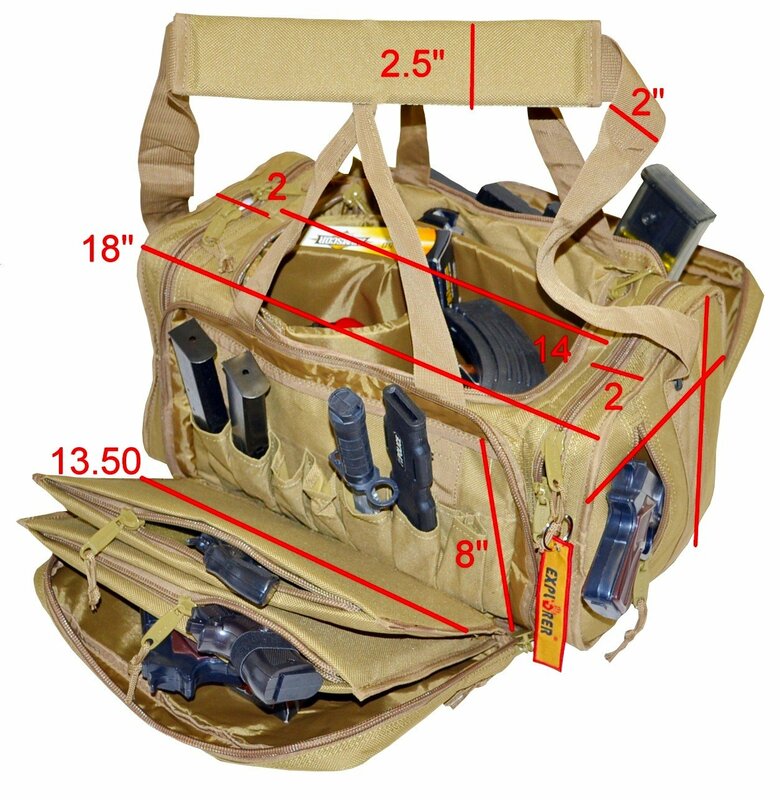 With internal elastic hoops designed to hold 16 double stack Pistol magazines or 8 AR-15 magazines, making this the best AR-15 range bag there is on the market today. This bag has Large Metal D-Rings and comes with a heavy duty wide Padded Shoulder Strap secured by a Metal Clasp Hook. Just as you won’t buy any weapon without considering its properties and application, so too you must not buy any bag for gun range applications. There are special bags designed for this, and they come with key features that you must never forgo. Zippers: These must be large, chunky zippers secured with triple stitching, and come with grommets for padlocking. Material: Don’t buy a bag less than 600-D Polyester. Stitching: Do not buy anything that has less than double stitching, a triple is the best. Size: make sure the bag is large enough to carry all your ammo, accessories, food, drink and of course extra weapons, and still have room for more. If you are using tactical support equipment (computers, GPS, Satellite Phones, etc.) make sure the bag can contain them as well. Straps and Handles: Make sure the bag can be carried comfortably. Design and Durability: Buy a bag that suits the purpose, if it’s only carrying to a range, or whether it is for use in the field. When combining the materials, stitching and carrying applications, make sure the bag will survive the conditions you intend to enter. Pockets are a must, you never seem to get enough of them, but make sure there is not too many to forget where you place items. Price: Don’t buy the most expensive, only buy the most compatible with what you need. A gun range bag has to meet the rigors of weight, sharp and hard surfaces, and rough adverse conditions and environments. Ideally, you want a waterproof, tear and wear a proof bag that is large enough to carry all you need, and sturdy enough to maintain its integrity while you carry it. Zippers are very important; they are usually the first to go, so make sure that the zippers are exceptional, and don’t buy thin dolly zippered bags, this is a sign that the whole unit is crap. Make sure its easy to carry, try a bag on for size, or only buy a recommended unit. If you are not sure, check online reviews, or consult with fellow professionals, but not newbies, only ask the experienced, and even military or law enforcement veterans. Bottom line: A good gun range bag will protect your equipment, and also support your musculo-skeletal frame, which means you won’t get back injuries or strain yourself when toting the bag.